Once Rose had developed a reputation for consistently providing customers with impeccable service, we felt that there was a need to offer such a level of service that caters specifically to groups. That’s why we created our Charter Division. Organizing transportation for large groups can be incredibly overwhelming. Luckily, when you ride with Rose, we’re with you every step of the way. Our friendly and knowledgeable Customer Service Representatives take a personal approach to planning, logistics, and budgeting assistance. We back up that expertise with a 24/7 dispatch that monitors trips from start to finish using state-of-the-art technology, including drive cams, GPS, and flight tracking. As a DOT-compliant company, we work hard to make sure that groups are transported safely and comfortably. Every driver we employ is not only DOT certified, but chauffeur trained as well. Passengers are guaranteed to receive exceptional chauffeured service for the same amount you would pay another charter company. Rose’s Charter Division is eager to assist you in planning the ground transportation for your next group event. Please call 704-716-8190 to be connected with a Charter Service Representative. 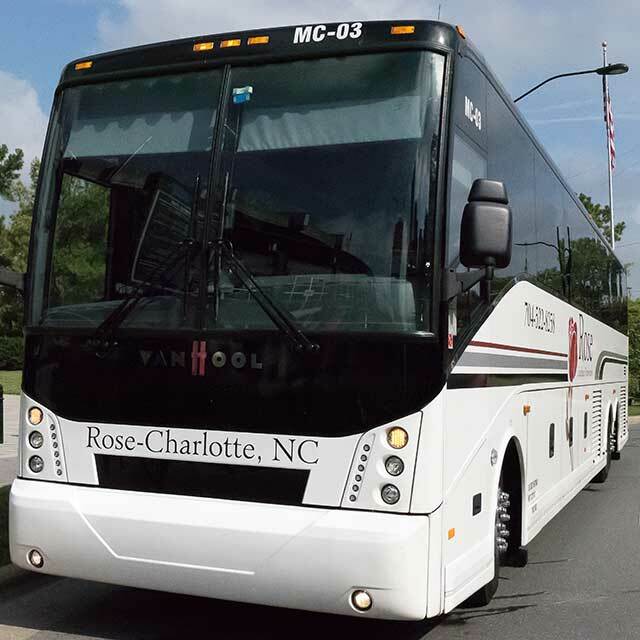 Rose is a member of the American Bus Association, the North Carolina Motorcoach Association, and the United Motorcoach Association. Start planning your next adventure with Rose. We are happy to provide the ground transportation or assist you in planning your trip from beginning to end. We can even provide tour escorts and guides. The Queen City is full of fascinating things to do and discover. Let Rose provide your group with a guided tour of Charlotte, whether you’re looking to familiarize yourself with the city or would prefer an in-depth dive into the city’s rich history. Arts, culture, sophistication, exploration. Charlotte’s museums have it all. There are lots to choose from, including the Levine Museum of the New South, Discovery Place, the Mint Museum, and the Carolinas Aviation Museum, to name a few. Pick a museum or two that suits your interests, and we’ll get you there. Retail offerings in Charlotte can satisfy even the most discerning tastes. The South Park Mall, Carolina Place Mall, and Concord Mills are the perfect places for a day of retail therapy. Once a major tobacco-growing region, the Yadkin Valley is now home to more than a dozen thriving, award-winning wineries. Let Rose provide luxury transportation to your choice of wineries in North Carolina’s first federally approved American Viticultural Area. An excursion to the Biltmore, America’s largest home, starts with a scenic drive through the beautiful Blue Ridge Mountains to Asheville, N.C. The fully-furnished mansion, complete with world-class gardens and winery, is open year round. Biltmore is also decorated for each season, so there is always something new to experience here. Ancient oaks draped in Spanish moss bring to mind visions of a historical, old world. Your tour can include shopping, dining, recreation, ghost tours, boat cruises, and more. ATL is a city of Southern charm and sophistication. It has something for everyone: museums, the Georgia Aquarium, parks and gardens, historic neighborhoods, a vibrant dining and nightlife scene, and more. In the heart of East Tennessee, you’ll find a world of natural wonders, including one of the largest National Parks in the country: the Great Smoky Mountains. The nearby communities of Gatlinburg, Pigeon Forge, and Sevierville offer plenty of family-friendly entertainment, shopping, tours, theme parks, and more. It’s a breathtaking place to visit any time of year. A trip to the nation’s capital is an experience you’ll never forget. There is so much to do in Washington, D.C. that it may take several trips to see everything the city has to offer. Visit for world-class museums, landmarks, arts and culture, parks, dining, and so much more.